Go Old-School. Use a pencil. If you ask any longtime farmer to give you their best advice for having a successful harvest, they will likely tell you to keep basic records of your growing efforts. Which is why we developed the Perpetual Gardening Record Book -- the perfect method for tracking those basics. Basics like: when it rained and how much, first and last frosts, what was planted and when, and how it all fared -- for multiple years. That's right. With the Perpetual Gardening Record Book, you can see what's happening in your garden right now, as well as what happened in previous years -- at a glance. We regularly hear from customers about the many ways they use their Perpetual Gardening Record Book, including but not limited to: all activities and observations related to gardening, beekeeping, mushroom hunting, berry picking, seed sources, and of course -- everything related to the weather. 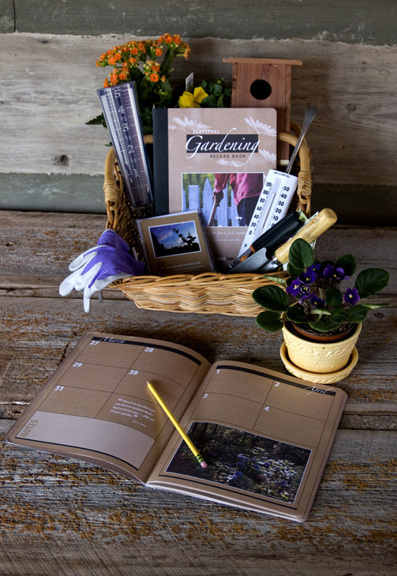 Made in Alabama using recycled materials, the 80 pages of brown craft paper include lined Calendar Pages, Growing Charts (inspired by the method Thomas Jefferson kept his garden records! ), Sketch Pages, and a Resource Page. The Perpetual Gardening Record Book -- works in every growing zone and needs no batteries, chargers, WiFi or cellular service. Only $14.95. Seriously, you can't beat it. * Great for teaching children to revel in their garden and backyard world! The more they write down their observations, the more they notice! The more they notice, the more they marvel. Featured on the Made in USA Challenge, Made in America Master List! Scroll on down to see what 'Keeping it Home' can get you -- All of our products are made in Alabama with a whole lot of Love. Click on image for more info. Click on image for more info. Click on image to see more info and pics! Click on image for more info. Click on image to see more pics and info! Click on image for more info. Click on image for more info. Click on image to see more pics and info! Click on image for more info. Click on image for more info. Click on image for more info. 8 unique cards per pack - Click on image to see more pics and info! Click on image for more info. Click on image for more info. Click on image for more info. Click on image for more details.